Comparing box office results from decades ago with those of today is not an easy task. Some say it’s impossible or inherently unfair. There are various things to account for: inflation, ticket prices, population size, number of theaters, new technologies such as streaming and home media. Back in the day there was no home video release of Star Wars 6 months after the theatrical release, so if you wanted to see a movie again, you had to go to a cinema, no other choice. Also, box office in North America is always measured in USD. Other countries, Germany, for example, have a different approach, here we count the number of tickets sold. Since Hollywood is interested in money the former approach does make sense in a way, but it also makes it very difficult to compare box office results for movies from even a decade ago, because of inflation. So for the overview in this article I did the following: I will not only give you the original box office results, but I also adjusted all box office results for inflation (2018 USD). 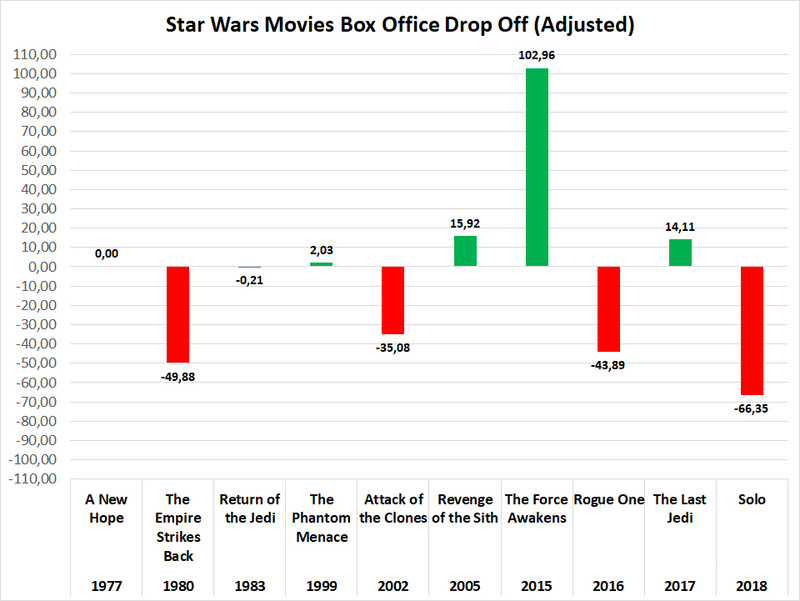 On top of that you will see several other metrics that will show you how Star Wars performed not only in relation to itself, but also in relation to overall box office in any given year. But enough talk, let’s delve into the numbers. What you see here is the original box office and the adjusted box office (in 2018 USD). Only the first release was considered, which means the various re-releases, special edition releases and 3D releases are missing. And sure, 1977 was a very different time, but still, the box office result of A New Hope is impressive by any measure. 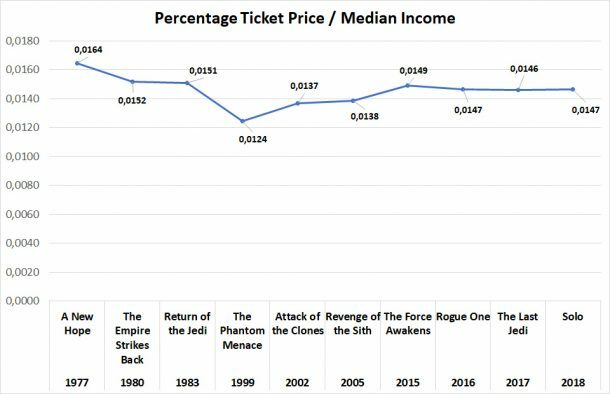 Adjusted for inflation it is the most successful Star Wars movie of all time. Also, it may surprise you that the adjusted box office for Return of the Jedi is slightly worse than Empire’s! But box office is only one metric, what about the number of tickets that were sold? To calculate the sold tickets I used data provided by the National Association of Theatre Owners, who provide data for average ticket prices going back several decades. As you can see once more A New Hope is in a league of its own. Please consider that back in 1977 there was no home media to speak of, no streaming, nothing, so if you wanted to see the movie you had to go to the theater, whereas the Disney era movies were released in a much different time. 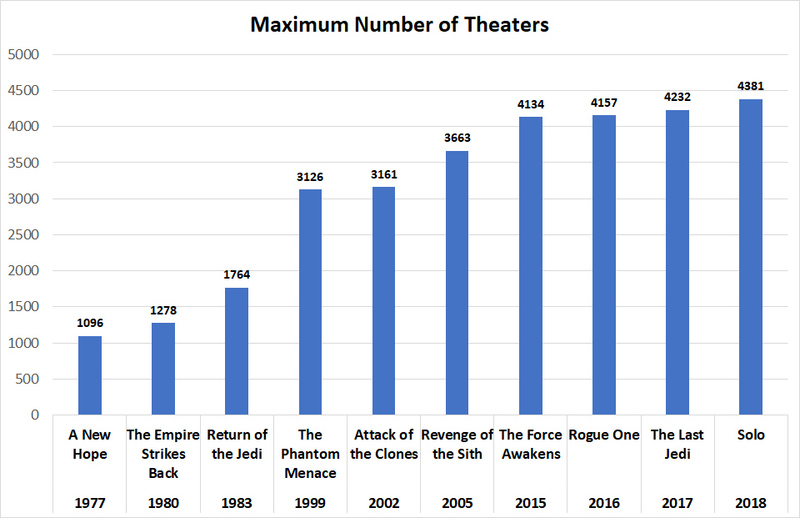 All that being considered the numbers for The Force Awakens are very impressive as well. 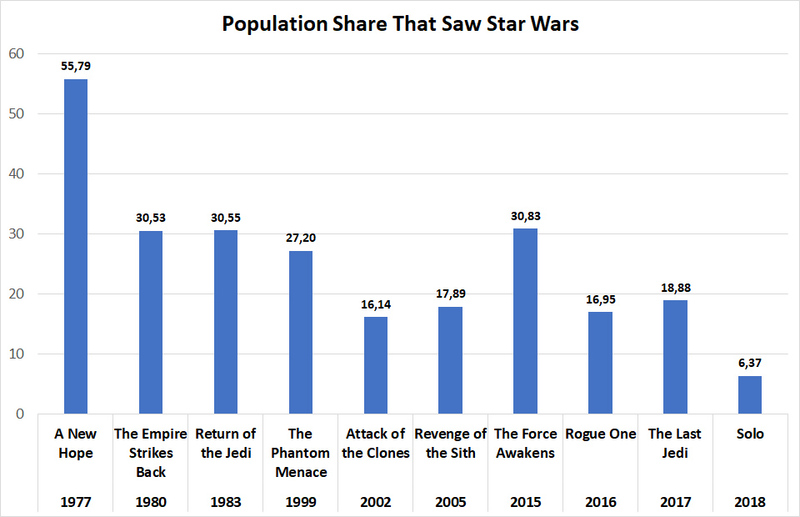 But nevertheless, looking just at the pure numbers, you can see that the Original Trilogy was in many ways the best of times for Star Wars, But again, those were different times. Also, even though Return of Jedi made somewhat less money (adjusted for inflation!) 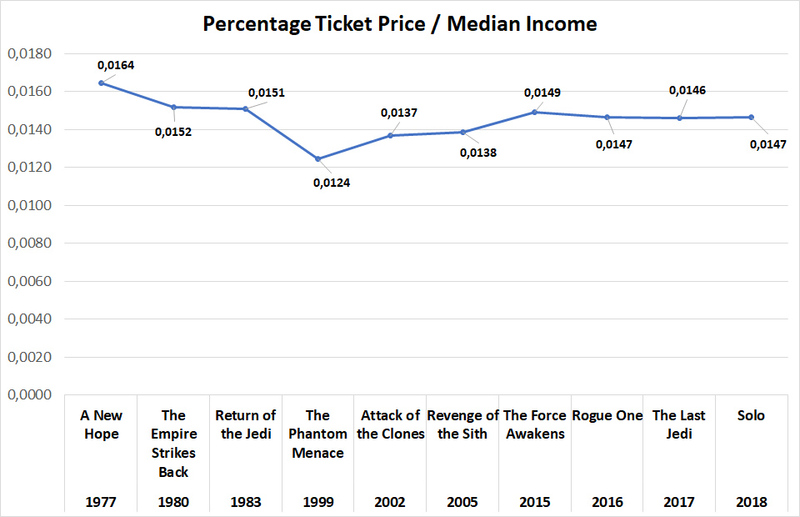 than Empire Strikes Back, it still sold more tickets because average ticket prices had dropped between 1983 and 1980. And even though we have home media and streaming today (you can see the effect with declining ticket sales ever since Attack of the Clones was released), the total number of tickets sold is much higher than 40 years ago. In 2018 USD total North American box office has been flat for the past two decades or so. in 1999 North American box office was about 11 billion USD (in 2018 USD!) and the 2018 total box office is 11.6 billion USD. Theatre owners counter declining ticket sales with higher prices. 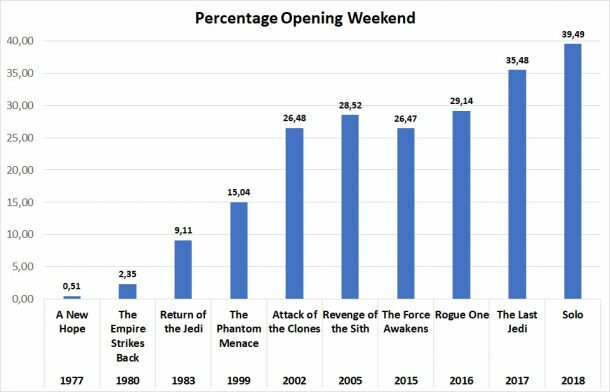 You can easily see the trend here, the closer we get to the present day the more frontloaded Star Wars movies become. Still, both The Last Jedi and especially Solo stand out here, which may indicate that audience reaction to both of these movies was not as positive as for the previous movies. A New Hope is once more an anomaly. The movie first had a limited release, only a few dozen theaters wanted to screen the movie, hence it’s ridiculously low opening weekend percentage. The Empire Strikes Back also had a somewhat limited release. 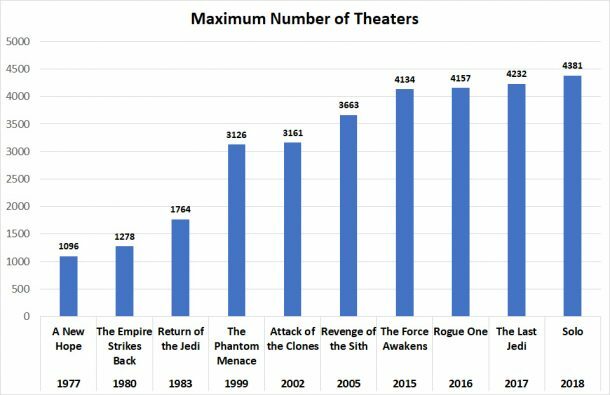 Back in those days the number of theaters actually increased over time for movies such as Star Wars. Today you get the full barrage on opening weekend, not so much back then. Both A New Hope and The Empire Strikes Back reached their maximum number of theaters only a few months after initial release. Something that is more or less unheard of these days. 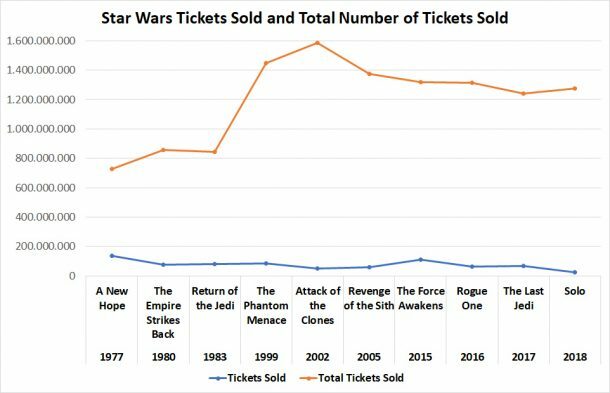 Note how few theaters A New Hope was shown in and how much money it still made. This is because back then theatrical runs were much, much longer than today. A New Hope still made good money in December of 1977. Let’s look at drop off between movies. How do the Star Wars movies compare here? So what does this chart tell us? 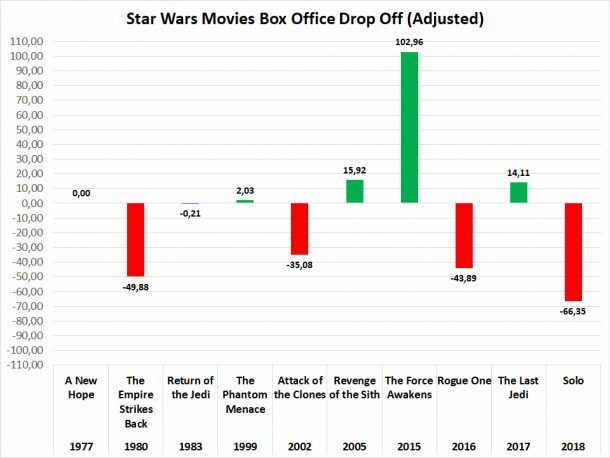 It tells us that The Empire Strikes Back made almost 50% less money than A New Hope (in 2018 USD). 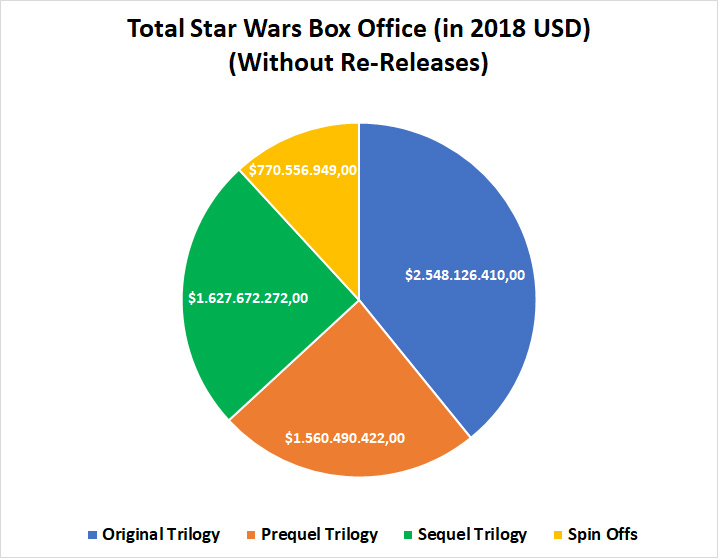 The Last Jedi made about 14% more than Rogue One. But it made 35.98% less than The Force Awakens. And compared to Rogue One, Solo made 61.61% less at the box office. An abysmal number. So far we have looked at absolute performance. But what about relative box office performance? 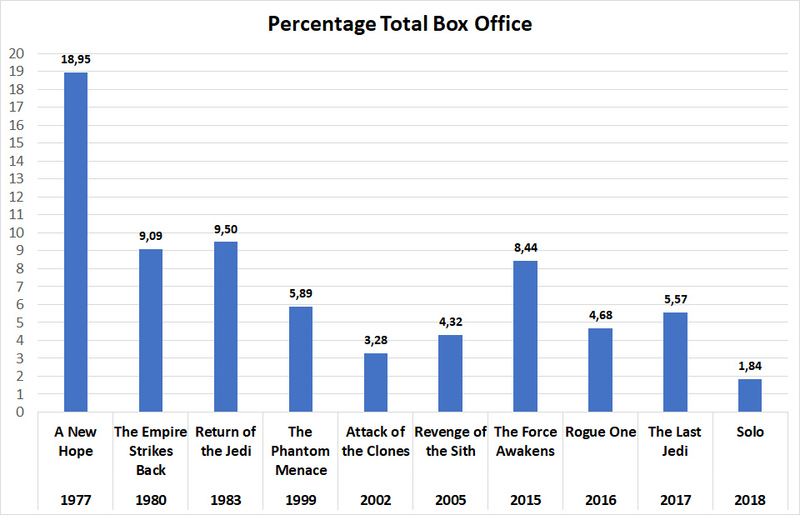 How did Star Wars fare when compared with total box office in the year of release? This will give us a somewhat better comparison between the various trilogies than pure box office numbers can do. Behold the phenomenon that was A New Hope, it cannot be overstated. Almost 19% of the 1977 box office was due to Star Wars. But there are some caveats, of course. Back then there was much less competition. Unfortunately there is no real data for the number of theatrical movie releases in 1977. But to give you an idea: Box Office Mojo lists 163 movies for 1983, for 2018 the number is 873. So we have a lot more releases in modern times, which makes it much more difficult for any movie to gain a comparable share of the total box office. Which makes The Force Awakens all the more amazing, even if it doesn’t come close to A New Hope, it’s still a very impressive number and certainly very remarkable for a movie in the modern era. 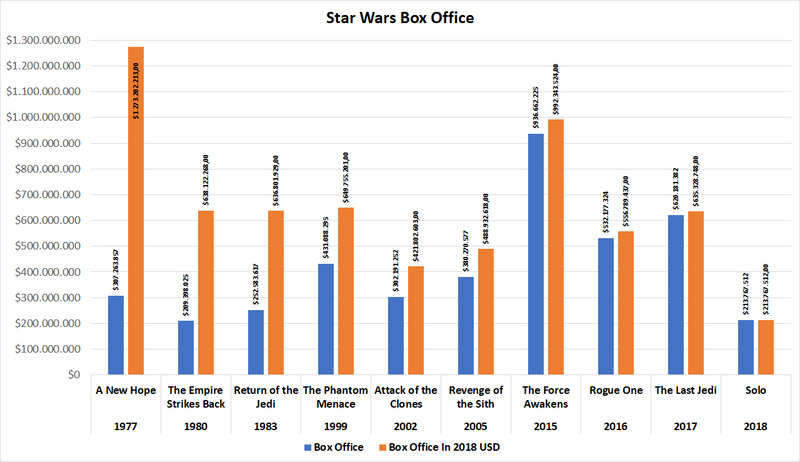 The box office share of Star Wars reflects the trend that more and more movies see a release and that more SciFi/Action blockbusters get released. But we can delve even deeper. The population size changes. There are a lot more people and potential moviegoers today than there were in 1977 – about 120 million more people in the USA, Canada and Puerto Rico combined. For the historical population size I used official census data and since box office results are always for North America the USA, Canada and Puerto Rico were considered here. Guam is also considered for “North American” box office, but the population size of Guam is negligble. And as you can see A New Hope stands out once more. Almost 56% of the population back then saw the movie in theaters. Now, of course the actual share is lower, since quite a few people went to see the movie more than once, but there is no way to account for that. Still, more than half of the population in the USA, Canada and Puerto Rico is an impressive number no matter how many repeat viewings are included here. As you can see The Force Awakens once more manages to enter Original Trilogy territory by reaching almost 1/3 of all North Americans, only the other two Original Trilogy movies managed that. And as usual you can see that Solo underperfomed by quite a lot, unfortunately. Overall the Disney era mirrors the previous two trilogies. The first movie did incredbily well, and the subsequent movies never managed to reach as many people again. Relative drop off is similar. And if the trend continues then Episode IX will certainly sell more tickets than The Last Jedi. The real question is if it can come close to The Force Awakens. The look back tells us that this is highly unlikely. 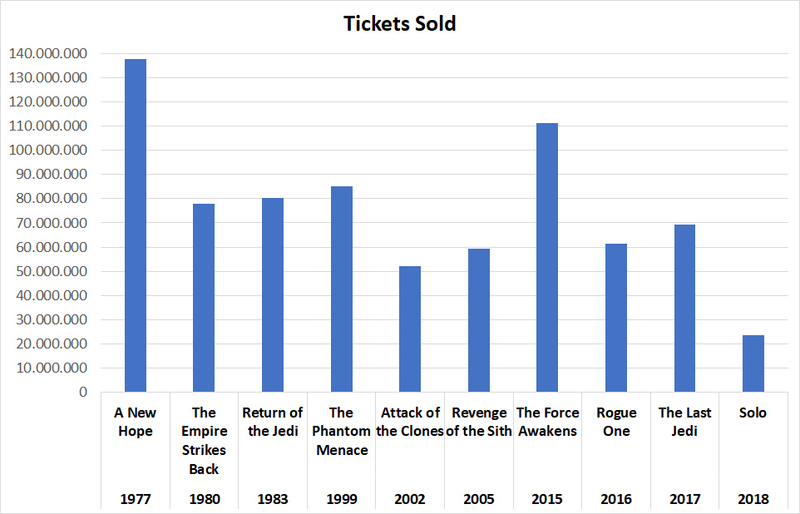 Both Return of the Jedi and Revenge of the Sith only saw a modest uptick in tickets sold. Episode IX will likely make more money (and sell more tickets) than The Last Jedi, but will probably not sell as many tickets as The Phantom Menace. You can also see that Star Wars was a really huge phenomenon back in the late 1970s and early 1980s, in today’s much more fragmented media and entertainment landscape it’s virtually impossible to reach that many people anymore. Of course you also have to account for home media sales these days and streaming, but how many of the people who buy the disc release or watch the stream already saw the movie in theaters? Star Wars – any franchise – reaches a lot less people these days than in previous decades. TV ratings decline, the number of tickets sold for each movie generally decline, it’s the times we live in and not a failing of modern Star Wars. You have so much entertainment to choose from these days that the average size of the slice you get is much smaller, even if the pie is bigger. Let’s move on to yet another metric: ticket prices! The blue line represents the original unadjusted ticket price. The orange line is in 2018 USD. 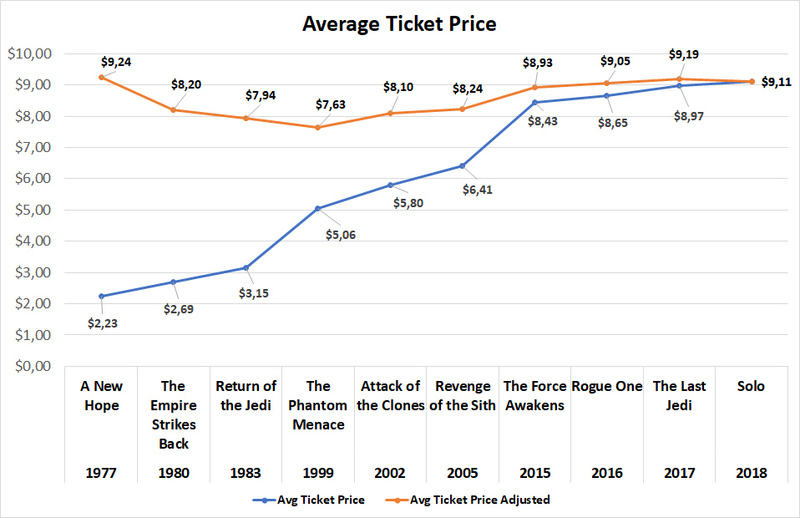 And despite what you may feel or think, the average theater ticket has not become that much more expensive. In fact, ticket prices in 1977 were comparatively higher than in 2018, which is certainly a surprise. For this graphic I calculated the share of the average ticket price against the median annual household income (in the US). I used the median income because it is less sensitive to outliers, one person making a lot of money does skew the average income, so the median income is a more realistic metric here. 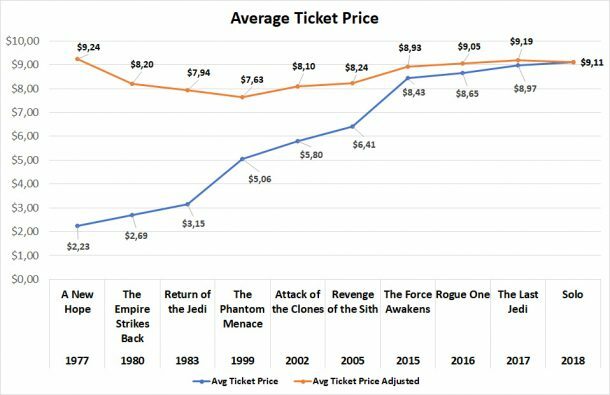 And as you can see relative ticket prices are more or less stagnant, there is an uptick in more recent times because of 3D, but even so, considering how the median income has increased a movie ticket today is more affordable than back in Original Trilogy days. That may be a surprise perhaps since people usually only remember how much cheaper things were decades ago, but decades ago people also earned much less money. 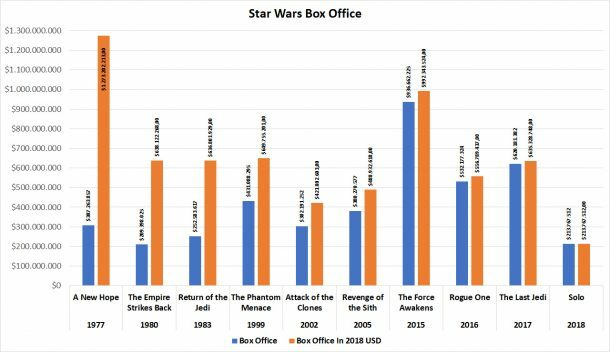 To finish this excursion into the history of Star Wars box office let’s look at overall performance, for this I only considered the initial releases, so 3D releases and special editions were left out! For this chart I once again used 2018 dollar values, it simply makes no sense otherwise, in my opinion. And as you can see the Original Trilogy reigns. The Sequel Trilogy will most likely not surpass the Original Trilogy, but again, different times, different era. Also, this is only for domestic box office. Worldwide box office will be about twice as much, more or less. And finally, a quick look at the MCU, the modern arch enemy of Star Wars (I am joking here). We now have 21 MCU movies, with Captain Marvel still in theaters and Endgame close to release. Adjusted for inflation the MCU has made $7.6 billion to date with 21 movies. Star Wars (not considering the re-releases!) has made $6.5 billion. But that is with 10 movies (not counting the animated movie). The average MCU movie makes about $363 million at the domestic box office. Star Wars makes $651 million. Just to show you that the MCU is so strong because of the sheer number of releases, but the average MCU movie usually does not set the box office world on fire. Neither did Solo, but chances are high Episode IX will be a huge hit. But whether or not it can beat Avengers Endgame remains to be seen. A New Hope is the movie all other Star Wars movies will forever use as a yardstick. Because of changing times no other Star Wars movie will probably ever come close again to it. 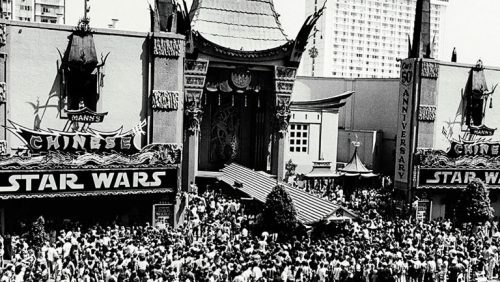 Anyone who was not around back in 1977 can probably hardly understand how much of a phenomenon Star Wars was back in the day, especially considering today’s media landscape. I hope the numbers give you somewhat of an idea here. When a theoretical 56% of the population in North America sees a movie in theaters you know something is a phenomenon. But The Force Awakens did really well back in 2015, considering the times we live in. Reaching almost 1/3 of the population is impressive. 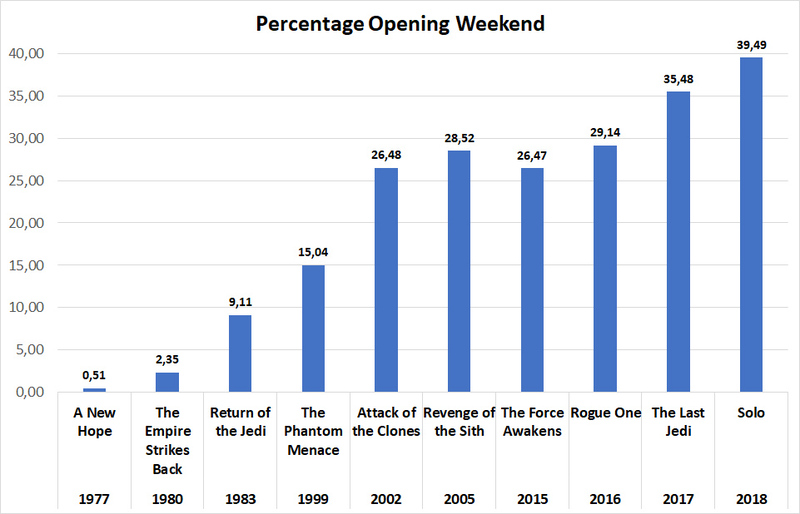 And even the much hated The Phantom Menace did really well in 1999. I hope you enjoyed this trip back in time and maybe you even learned a thing or two you didn’t know before! And the race is on for 2019, maybe Episode IX can outperform the Avengers. It will be difficult, worldwide box office is probably no contest for the MCU, since their movies usually have a much higher foreign box office share than Star Wars (thanks to the Chinese who simply cannot get into Star Wars), but domestic box office might tell a different story! We’ll see!